Labels are for jars, and not for you. You’re not about fitting in, but rather living authentically and joining a neighborhood that’s beauty is found in its eclectic mix of culture, personalities and lifestyles. 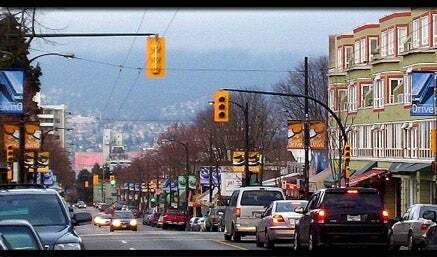 Welcome to the Commercial Drive neighbourhood, or what’s simply known by those who currently inhabit the east Vancouver neighborhood as “The Drive”. Your day can start with Italian inspired coffees at your local Starbucks or just across the street with the real thing, brewed to perfection by an Italian barista who lives and dies for gourmet coffees. Getting to work is a snap, with the Vancouver Skytrain gliding in and out of the corner of Commercial and Broadway. You might have just enough time to catch the morning headlines on local Vancouver newspapers, but will have to catch up on the day’s news on that first coffee break at work, as your commute to downtown or Burnaby is only minutes. Your weeknights will be spent enjoying the vocal styling’s of local bands or catching the game with your buddies at your favourite watering hole, to a poetry reading at the coffee house on The Drive. You keep active by squeezing in a workout at one of the many local gyms or getting in a game of tennis at the ever-welcoming Britannia Community Centre. Or perhaps you find nothing more relaxing or entertaining as an after dinner walk down The Drive to watch your diverse and eclectic neighbours converging together in harmony. Weekends are spent discovering some of East Vancouver’s well renowned independent grocer’s. While exploring the shelves of several Commercial Drive ethnic markets your taste buds will come alive again, with oils and spices that you never knew existed, but now can’t cook without. At the next birthday, anniversary, or holiday gift exchange your gift is the envy of all, and most remembered by its recipient. You came across a gift that was personal and one of a kind, at one of the many local retailers along Commercial Drive. Best of all Commercial Drive is a community that grows with you over time. You enjoy the energy and vibe of the clubs and coffee shops in your mid twenties and early thirties, but then find that the Drive is a great place to raise a family and introduce your children to what Canada and East Vancouver is best known for, a cultural salad bowl.